This detached holiday home has a private swimming pool. The home is ideal for families or friends. 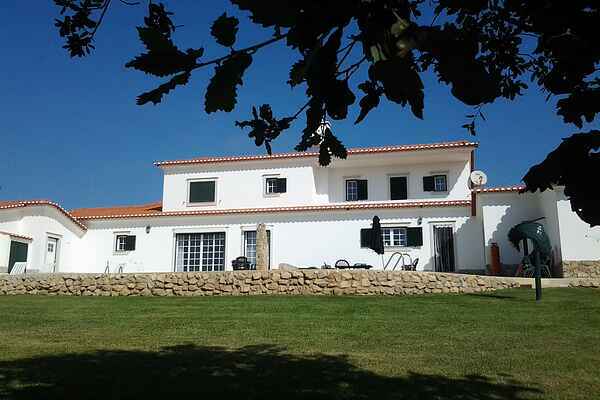 It is on the edge of the village of Ribamar and 1.5 km from the beach. The holiday home is at the end of a cul-de-sac at the top of a hill. The home is in Portuguese style and was originally for two families. It has been renovated and is now a comfortable holiday home for twelve people. The home enjoys plenty of privacy. There are two hallways on the ground floor. There is also a sitting room/library and living room. The garden is partially landscaped and is not enclosed. It enjoys an unobstructed view of the valley and the surrounding countryside. The private swimming pool and terrace are in the garden. There are several beaches a short drive away. They vary in length from 100 metres to 4km. The surrounding landscape is green and hilly. There are lots of interesting places worth visiting such as Mafra, Sintra, Obidos, Nazare and the Portuguese capital, Lisbon. Extra: Two sets of golf clubs are available.